It’s human nature to want to help someone who is down on their luck, even if that person is a stranger. Helping a child get down from the monkey bars, buying a homeless person a hot meal and helping an elderly person carry their groceries are all kind and generally safe things to do for a stranger. Although helping someone is a sweet gesture, some help is too risky to offer. Without a doubt, giving a ride to a hitchhiker falls under this category. Consider the scenario when picking up a hitchhike: The driver and possibly passengers will be in a confined, moving vehicle with a complete stranger. Depending on where the car is driving, there may not be any other people or vehicles around to witness anything, should something awful happen. It may be unfortunate and sad that a hitchhiker does not have any means to get where they’re trying to go, but help should not be offered at the expense of other peoples’ safety. The team at CarRegistrationAdvisors.org has compiled a short list of a few reasons why drivers should never pick up hitchhikers. The most immediate risk that picking up a hitchhiker poses is that all of the passengers are in a confined space, making it difficult to defend themselves, if need be. Even more dangerous, the confined space will be a moving vehicle. This means that it is almost impossible to escape without seriously injuring oneself. Even if a hitchhiker doesn’t have any pockets or bags, that does not mean that he or she is not hiding a weapon. Many weapons, like pocket knives, brass knuckles, pepper spray and certain types of guns are all small enough to hide in other places. The experts at CarRegistrationAdvisors.org strongly suggest that solo drivers not pick up hitchhikers. Drivers with no passengers are much more vulnerable to potential violence when picking up a hitchhiker. Because the driver has to focus on the road, it’s impossible to notice hitchhikers reaching for or preparing a weapon. Another disadvantage for solo drivers is that it may be nearly impossible for them to defend themselves while driving. The driver is likely to lose control, putting the passengers and other cars on the road at risk for a car accident. Without realizing it, many car owners have plenty of valuables in their cars: bank statements, receipts, money, personal information and much more. Giving a hitchhiker a ride means that he or she has access to everything in the car – even the car itself. It isn’t unheard of for hitchhikers to attempt to steal the car of the person who offered them a ride. A hitchhiker can become threatening or violent enough to force the passengers to leave the car and drive away with it. If the hitchhiker is armed, the passengers are completely defenseless in a moving vehicle. The team at CarRegistrationAdvisors.org notes that identity theft is a risk factor when it comes to picking up hitchhikers. 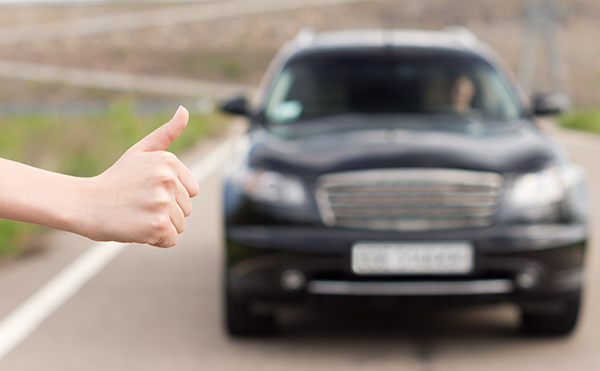 Depending on what’s in the car, hitchhikers can also gather enough information to steal a passenger’s identity. Once an identity is stolen, the thief can use the new identity to steal money, apply for credit cards and attempt many other things that can destroy a person’s financial stability. Many people do not realize that this can happen as a result of just giving a stranger a ride. CarRegistrationAdvisors.org does not recommend picking up hitchhikers, particularly when driving at night or when the roads are empty. Depending on where the car is driving, there’s a possibility that there may be no witnesses to account for any crimes that may occur after picking up a hitchhiker. For example, on empty roads or on the highway where most cars are driving at high speeds, there is not a good chance that an outsider saw the crime happen. If the driver had no other passengers besides the hitchhiker, this would mean that were no witnesses – at all.